POPULAR SIZES, IN STOCK! PRICES WITH AD ONLY! 6 MONTHS SPECIAL FINANCING AVAILABLE to credit approval. 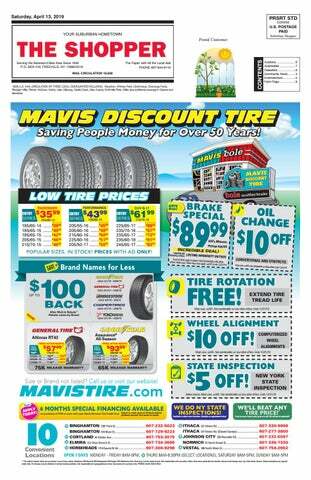 Minimum monthly on purchases of $199 or more with your Mavis Discount Tire Credit Card Subject payments required. See stores for details. WE DO NY STATE INSPECTIONS! Available at select store locations. Schedule an appointment today! If you’ve seen a lower price, give us a call. We will not be undersold! ** By mail-in rebate when you purchase a set of four, select, Goodyear OR General OR Bridgestone OR Cooper OR Yokohama tires. Must buy 4 of the same brand. Not combinable with any other offers. See store associate for details. Actual tread design may vary from those shown. Some items/sizes by special order only. Purchases may be limited to normal retail quantities. Not responsible for typographical errors. See stores for warranty info. PRICES VALID W/AD ONLY. curity deposit, call 607386-5517 before 2pm, and 607-226-8334 after 4pm. FOR RENT: 2 bedroom upstairs apartment, utilities included, $725/ month, No pets. Call 607-863-4540, available now. ROBERTS SCRAP Buying Junk cars and scrap metal. 607-6927510. COINS, WANTED: CURRENCY, gold, silver, stamps, jewelry - Highest Prices Paid. By appointment or Cayuga Coins, Dewitt Mall, Ithaca. 607-277-3301 or 607-277-2646. KEEP YOUR PETS SAFE! If you ﬁnd yourself in the position of having to ﬁnd a good home for your pet, keep a few things in mind. When placing your ad, leave out the word free, and don’t give your pet to the ﬁrst person who calls. Get their phone number and address and then check them out. Screen carefully, as people are not always what they appear to be. ������������������������������������������������ Always Ready Made Bouquets! LAWN CARE: Mowing, edging, hydro seeding, rototilling, mulch, fertilizer, planting and removal trees/shrubs, pressure washing, debris removal. Longsrun Construction & Landscaping LLC, 607-206-4936 BBB 5 star rating. GREENHOUSE FLOWERS & VEGETABLES & PLANTS, Opens May 4th at 3800 Sperry Rd., McGraw NY 13101. Open Mon-Sat, 9-5pm. Closed Sundays, Closed the day of May 30th. changes heating from the inside out. Burns hotter. Cleans easier. Lasts longer. The dry fire chamber prevents corrosion and creosote buildup, and the smart control board adjusts the burn rate to maximize efficiency. BURN BARRELS $12 ech, 607-205-9547, keep this ad for future use. SMITHVILLE 10.662 acres, 600 ft frontage on quiet maintained road, stream in back, close to State land, 3,200 acres. $12,900. 607-656-9637 ANTIQUE FERGUSON 30 tractor $2,000. Antique IH Cub low Boy tractor with woods 59” mower in excellent condition, $2,500. 315-4971048 SINGLE CH 7 BANKRUPTCY $800, Foreclosure Relief, Divorce, REAL Estate, Auto Accidents, Serious & Small Injury . Mark Gugino, 144 Bald Hill Rd., Ithaca. Phone 607-319-0766 bk@twcny.rr.com Atty Advertising Debt Relief NDNY only. H and E Tarp and Upholstery Shop, We do boat seats -n- tarps. Make all kinds of tarps and upholstery, All kinds of seats, chairs, couches. Located at 3501 McGraw Marathon Road, McGraw, NY 13101. EXCAVATOR, Drainage, Concrete work. blacktop & concrete sealing, water & sewer lines, PATIOS FLOOR TOPPINGS, bull dozer, Retaining walls, material hauling, mowing, lawn care, hydro seeding, debris removal, handyman services. Pressure Washing. Firewood year round, YOUR LOGS INTO FIREWOOD. Tree Trimming. Roof Gutters. Fully insured. Longsrun Construction & Landscaping LLC. 607-206-4936 BBB 5 Star Rating. KMA’S ROOFING Demo and Haul Away, All your Rooﬁng Needs. We Demo Anything, Haul Away Everything! Insured and Reasonable. Call me 607-749-8720 Kevin Amidon. BLACK WALNUT LUMBER FOR SALE: 400 BF, 5/4 air dried to 9%, $11.00 BF. Evenings, 315-364-5534, Days 315-237-2860 FIREWOOD YEAR ROUND, custom cut, your logs made into your ﬁrewood, fully insured, 607-206-4936, Longsrun Constructions & Landscaping, LLC, BBB 5 star rating. GOT MUD, NEED STONE? Hauling rock, stone, gravel for all your driveway and parking lot needs. You call, we haul. Call us at Stone Kote, 607-6567605, 607-221-0331 STORE POSITION OPEN; Seeking part time (15-20 hrs/week) Store Manager for non proﬁt. Retail experience and good communication skills a plus. Minimum wage. Application available at Cortland Chenango Rural Services, Inc., 2704 Lower Cincinnatus Rd., Cincinnatus, NY. a friendly and Lawn Tractors $77.38 inviting place Lawn & Garden A Month for Tractors 48 Months to shop for Includes Tax to Qualified Buyers Lawn Tractor See Store for Details Until 04-30-19 new equipment, Attachments Compact Front Mowers Utility Tractors purchase Now Thru 04/30/19 Commercial 0% APR used equipment, Walk Behinds for 60 Months Compact To qualified buyers. and have Utility Tractors See store for details. your current Tractor Attachments equipment serviced. Utility Tractors Utility Vehicles It’s Deere Season! Great financing available! Come in and browse our large selection. Everything Stored Inside!! Thank you to all those who expressed their condolences, support, prayers & thoughts. Also, a special Thank you to Kevin Sharpe Funeral Home & Cincinnatus Auxiliary & Firemen. Hose N Stock, LLC. Articles of Organization ﬁled with Secretary of State of New York (SSNY) on 12/13/2018–. NY ofﬁce location: Cortland County. SSNY has been designated as agent of the LLC upon whom process against it may be served. The P.O address to which the SSNY shall mail a copy of any process against the LLC served upon him/her is 3332 St. Rt. 26, Cincinnatus NY, 13040. Purpose/character of LLC: Any lawful purpose. Riverside Cemetery Association will hold their Annual Meeting on Tuesday, April 16, 2019 at 7:00 PM. The meeting will be held in the Tioughnioga Room of the Whitney Point Library on Main Street in Whitney Point, NY. Lot owners are encouraged to attend. YOUR FLAG & DECORATE YOUR BIKE!! Absolute Real Estate Auction 2-Family Home On Village Lot 6 Brook St., Newark Valley, NY Wednesday April 17, 2019 6:00PM Auction To Be Held Onsite @ 6 Brook St., Newark Valley, NY; 2-Family Home On Village Lot 2-Family Home – 3 Bedrooms, 1 ½ Baths On 1 Side – 1 Bedroom, 1 Bath On In-Law Apartment Side; Has Lg. 2-Car Detached Grg. w/ Attic; All Situated On 123’ x 63’ +/- Village Lot w/ Village Utilities; Home Needs TLC; Come Take A Look; Property Sells Absolute, To The Highest Bidder – Regardless Of Price!! ; Home Sold As-Is, Where-Is, How – Is, No Warranties; Any Tests Wanted Or Needed Must Be Done Prior To Auction; Terms On Real Estate: A 10% Buyers Premium Will Be Added To The Final Bid Price, The Total Becomes The Purchase Price. 25% Down of Purchase Price Required Day Of Auction In Cash Or Good Check w/ Positive ID, Balance Due On Closing in 30 Days – Sells Subject To No Contingencies, Be Prepared; For More Details & Pics Refer To Our Website @ www.manasseauctions.com; Open House: Day Of Auction From 5:00PM Until Auction Time; Auctioneers & Licensed Real Estate Brokers Whitney Point, N.Y. 13862 607-692-4540 / 1-800-MANASSE www.manasseauctions.com In Our 54th Year in Business Conducting all Types of Auctions!! ZIPCODES You Need to Cover! BIG IMPACT in your local community! AS LOW AS 7¢ PER HOME! • Nice selection of bright, attention-getting colors • Distributed every Saturday in The Shopper by U.S. Mail • Cover every home and business in your market area! Get 200 extra in-store copies of your flyer - NO CHARGE! Try Target Marketing today... you will be amazed at the responses! Ask us about our FREE six month warranty! WE WORK ON MOST MAKES & MODELS. ALL WORK WARRANTIED.